India is a country of diverse cultures and religions which translates to too many festivals and celebrations year round. The latter half of the year, August to December is a period for festivals across all regions. Unfortunately, it is also a time for cheating on fitness routines. We may not do this intentionally though. Festivals are when families and friends come together, host countless rounds of parties, and distribute gifts, chocolates, sweets, soft drinks, and alcohol. Such foods can take their toll on health, causing nutritional imbalance and weight gain. Therefore, it is important to regulate the system with healthy foods, balanced diet, and regular exercise to maintain a healthy weight and physique. 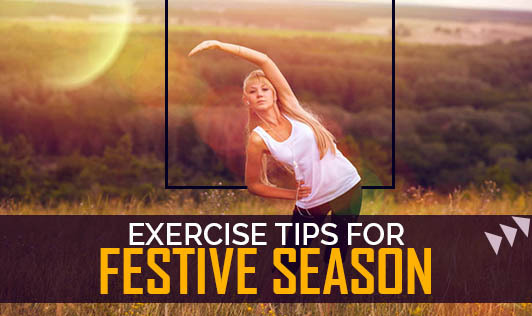 Let's begin with some tips for exercising- some easy exercises for the upcoming festival season. Warm Ups: These are a must and can include jumping jacks, spot jogging, twisting, neck rotations, and toe touches. The purpose is to improve mobility, promote blood circulation, and to check postural techniques. Stretches: They can include side and neck stretches- tadasan or overhead stretch, hamstring stretches, and cat camel stretch or ushtrasan, along with 8 to 10 rounds of suryanamaskars to help you achieve better flexibility and gain excellent results. Strength Training Exercises: They include squats, lunges, and leg kicks, perfect for shaping the lower body and toning and strengthening the hips and thighs. Do 2 sets of 20 counts each. Abdominal & Core Strengthening Exercises: Not only are exercises like crunches, reverse crunches, stationary cycling, and oblique crunches ideal for muscle toning and conditioning, they are also good for preventing lower back problems. Yoga Asanas: Trikonasan, pawanmukthasan, bhujangasan, dhanurasan, jhanushirsasan, naukasan and vajrasan, ardhachandrasan, and sethubandhasan improves one’s strength, stamina, cardiovascular, respiratory and endocrine function. They also improve posture and energy levels, reduce stress, and strengthen the immune system. Shavasan: Last but not the least, lie down in this pose to relax your mind and body. Shavasan helps the body cool down after exercise. Pranayama: At least 10 minutes of these exercises like anulom-vilom, kapalbhati, and om chanting are important for bringing about positivity, reducing stress, and improving breathing. Most of these exercises are easy and can be done at home. With proper guidance, discipline, and consistency, it is easy to achieve overall wellbeing during the festival season.